ATC HDA-DP10 review | What Hi-Fi? Ever since Apple killed the world’s most popular music player, there has been something of a vacuum waiting for a product to deliver similar ease of use and performance. 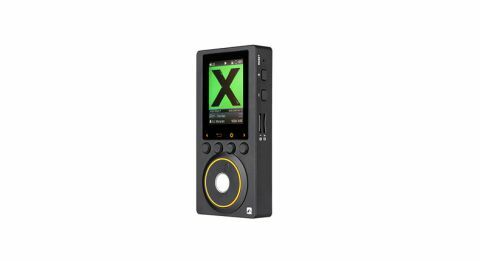 The ATC HDA-DP10 certainly looks the part – it’s the sort of portable music player you might get if you put ‘iPod nostalgia’ on a bulk-up diet. The clickwheel draws you in - but extra buttons, expandable memory and a more sophisticated DAC all push the design further. Although it looks similar to an iPod, the HDA-DP10 doesn’t quite capture its essence. It sits approximately half the height of your average smartphone and is about three times as thick. Its smooth surfaces are pleasing, and it feels well-proportioned when you hold it. Powering up, using the button on the top of the player, lights up its 2in 240 x 320 screen. Below the screen are four buttons – the two on the far left and right control playback, while the others are for getting to the main menu or music settings. Navigation through these menus is done with the clickwheel but, strangely, the volume is handled by separate buttons on the right-hand side. They’re all fairly responsive, but the click of each button sounds a bit plasticky and your finger is occasionally prone to slipping over the clickwheel. There’s also a lock button on the other side of the HDA-DP10, which is separate from the power and screen-dimmer button. If you turn off the screen but forget to lock the player (as we do once or twice), any absent-minded button pressing will fiddle with your music. Finally, the bottom has a line-out connection, a 3.5mm output, and a toggle to change the gain from +3dB to +6dB (which helps match the player to the sensitivity of your headphones). On the whole, it’s a more scattered approach than we’d like, and it does affect the player’s usability – especially when compared to similarly priced touch-screen players such as the Award-winning Cowon Plenue D.
The software could be refined too. Some of the messages that pop up when the player turns off (“See You Soon!”) or when you’re yet to mark songs as favourites (“no songs sound [sic]! please add the songs”), make the player feel less refined than you might expect at the price. Keeping all of this running is a 2400mAh battery, charged by a MicroUSB connection. ATC claims it will power the player for nine hours. While there isn’t any built-in storage, the HDA-DP10 comes with a 32GB MicroSD card in the box which will hold around 10,000 MP3s. The player has a maximum of 256GB of storage (across two MicroSD cards) that slot into the two ports on its side. Of course, you’re not just limited to MP3s – WAV, ALAC, AIFF and FLAC files up to 24bit/192kHz resolution are supported, as well as DSD64. All of these are converted from digital to analogue through a 32bit AK4490 DAC. Loading up the player with a range of music, the ATC HDA-DP10 performs adequately and goes loud too - so those with less sensitive headphones shouldn’t have an issue. Test its mettle with Metallica’s Nothing Else Matters and the best of this player is brought out in the bass. Deep, thumpy, punchy, and tight – each low boom of the drums hits your ears with force and insight, whether it’s the single beats laying the foundation or the drums that underlie the electric guitar flourishes. There’s also respectable grasp of the padded, thick texture of each beat, giving a fair representation of the differences between the larger foot drum and the smaller rack drums. The HDA-DP10 also has a decent sense of timing, integrating the pace of the guitar riffs with the speed of the drums pretty nicely. It’s not as precise as the likes of the Plenue D - which gets your toes tapping with far less effort - but it’s listenable nonetheless. That sense of momentum translates relatively well to Ed Sheeran’s One and the rapid acoustic guitar. Those treble notes are also kept separate from the midrange, while still providing a cohesive whole. The frequency range is well balanced across the board - between the drummer's arrival midway through the track, Sheeran’s breathy vocals, the guitar and the smooth cuts of the strings, the HDA-DP10 does well to let each have its say. That said, we would like a more spacious sound from the player - it can come across as a little closed-in and small-scale. We play Fleetwood Mac’s Go Your Own Way, and where the Cowon has a laid-back approach that allows the sound to stretch out and find its own space, the HDA-DP10 feels a tad strained and contained. The Cowon handles the changes in dynamics better too, making the HDA-DP10 sound comparatively flat. The way the vocals spark up for the iconic chorus should be intense, but it’s all too matter-of-fact from the ATC. The ATC HDA-DP10 almost certainly sounds better than your smartphone, but it has quite some way to go before it worries the best of its rivals. While it goes loud and has commendable bass potency, the relative lack of dynamism, openness and detail – alongside its unintuitive button layout – all mean we can’t truly recommend it.